Look, we’re willing to tell you our biggest secret. It’s the secret that keeps people coming back to our restaurants to pay absurd prices for meals that cost us nearly nothing to make. After we tell you this secret, you’ll have the option of reproducing it at home whenever you desire. This will make your food at least as good as ours, and probably even better. It’s also going to make our business model seem obsolete to you, and our very lifeblood will be threatened. But we are going to tell you anyways. Interested? But you have to agree to one thing. After we tell you our secret, you have to agree to try it at least one time, no questions asked. This post is the equivalent of making that deal with the ten chefs. You have to agree to try it at least one time. Deal? OK, so what’s the first word out of the collective mouth of the ten chefs? 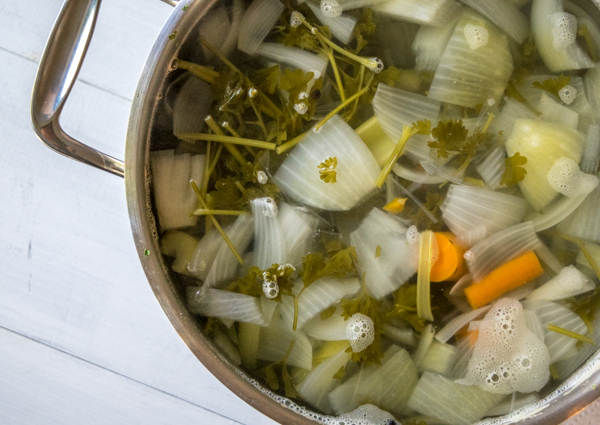 Whether it’s chicken stock, beef stock, or vegetable stock, their secret weapon is always going to be the stock. Fresh made stock is so rich and vibrant that it can make the simplest of dishes taste like, well…like a Michelin starred chef made it. 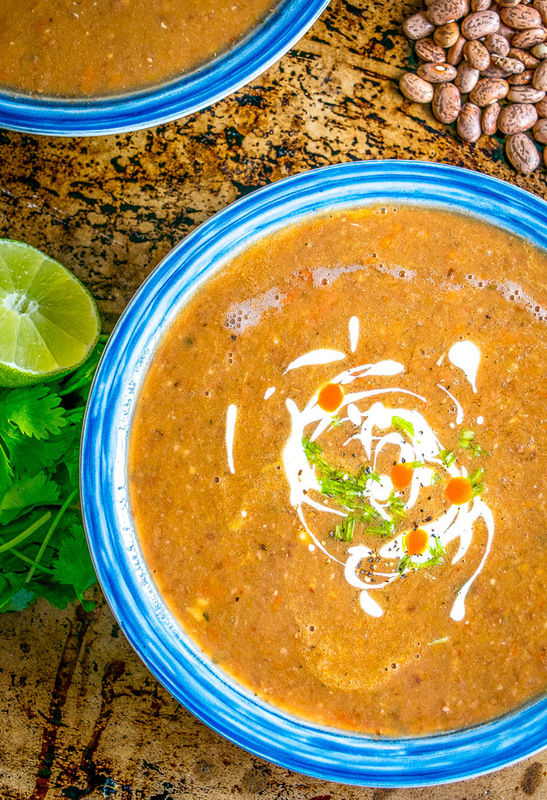 Soups, sauces, and grains will dramatically improve when made with high quality stock. 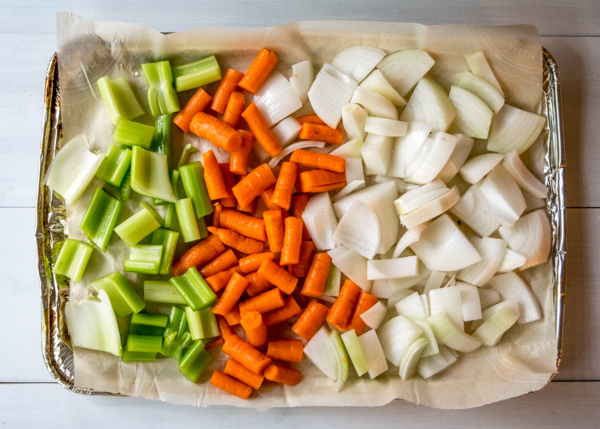 Here we’ll be looking at the simplest way to get fresh stock in your kitchen: vegetable stock. 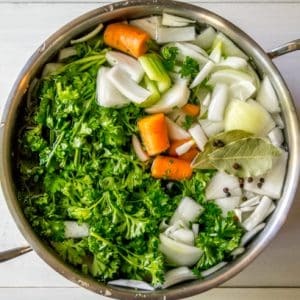 Vegetable stock can rival even the finest meat-based stocks and it is ridiculously easy to make. Ask the ten chefs how they make it and each of them would have their own version. Each would claim this is how it’s done. But the surprising thing is…the recipe doesn’t really matter that much. 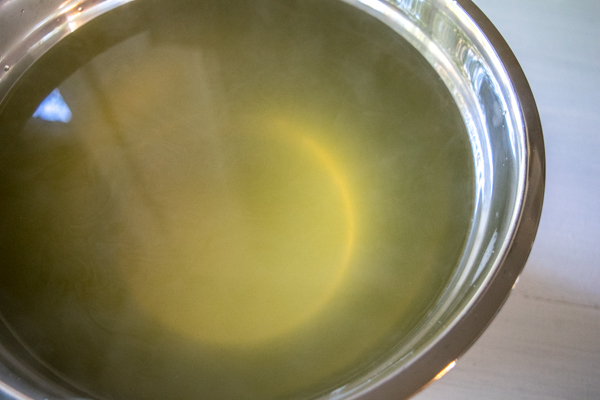 Once you get the basics down then the simple act of making the stock creates 90 percent of its goodness, while the specifics of the recipe make up the other 10 percent. So the most important thing is to just make it. Deal? 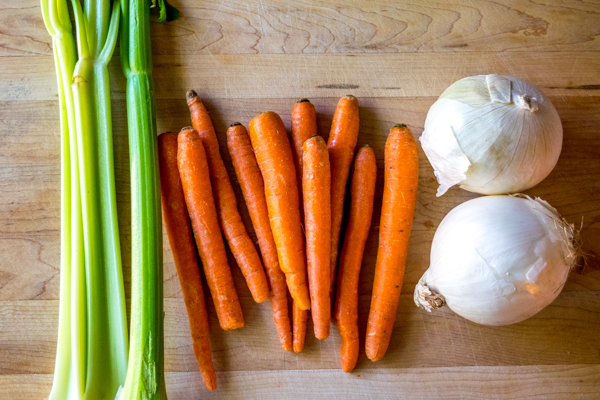 The classic mirepoix for stock is onion, carrot, and celery, so we’ll start with that. This roughly translates into 2 large onions, 10 small carrots, and 3-4 stalks of celery. Chop them up into evenly sized chunks, this will increase the surface area that gets exposed to the water. 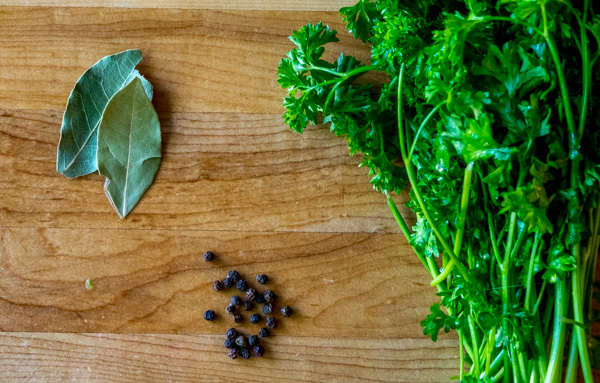 The most common second tier ingredients are parsley, thyme, bay leaves, and peppercorns. We’ll add 1 bunch parsley, 10-15 peppercorns, and a bay leaf. I don’t have any fresh thyme so I won’t add any. No problem! Remember, just making it is 90 percent of the battle. So if you don’t have access to any of the above ingredients you are still marching onwards. Into the pot they go along with the chopped up veggies. Fill the pot to the brim with cold water. Bring to a boil and then reduce heat so it can simmer. Congratulations, the hard part is over. Strain into a large bowl and let cool. I typically get rid of the leftover veggies first and then use a mesh strainer lined with cheesecloth to strain the remaining liquid. Once cooled portion it out. I like to use 2 cup portions because this pairs well with 1 cup of rice for Arroz Rojo. 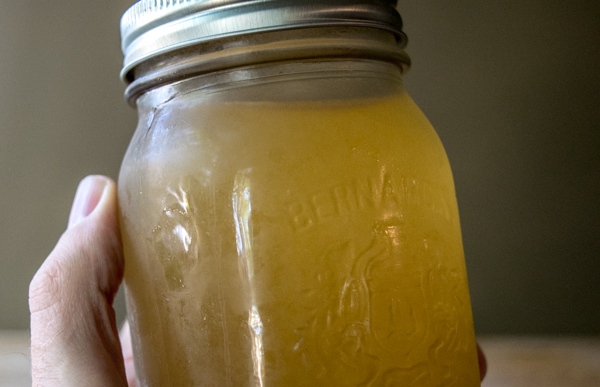 You can use larger portions if you plan on using the stock for soup. Think of stock like the engine in a car. You don’t see it but it’s always in there doing the work. And to get a feel for the engine you have to take the car for a spin. For me, that means adding stock to dishes like Arroz Rojo, Cilantro Lime Rice, Sopa Aguacate, Enchiladas Suizas, etc. 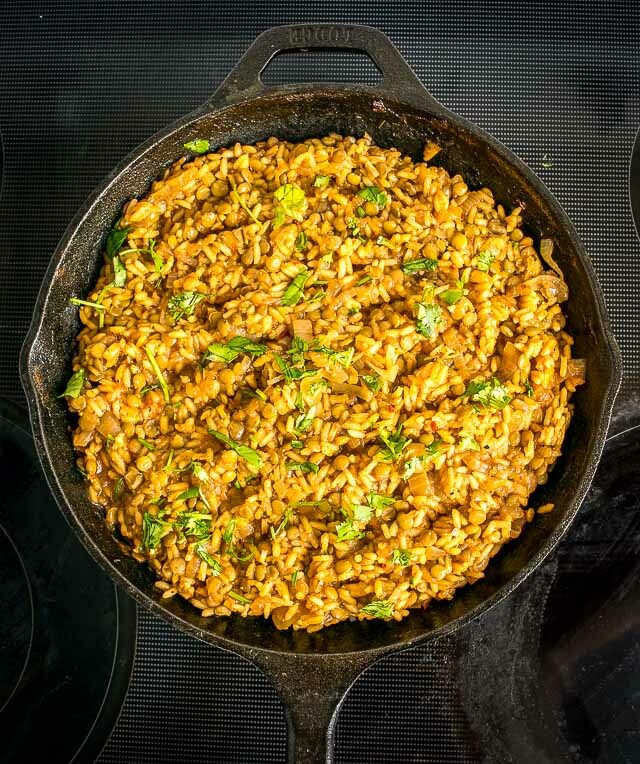 A simple Mexican rice dish is transformed into something otherworldly when you simmer the rice in fresh stock. Once you try it you’ll never go back to cooking rice in water. It works in other dishes too: risottos, soups, sauces, gravy…they all taste infinitely better when made with fresh stock. There is one other additional technique that you can keep in mind for future batches. 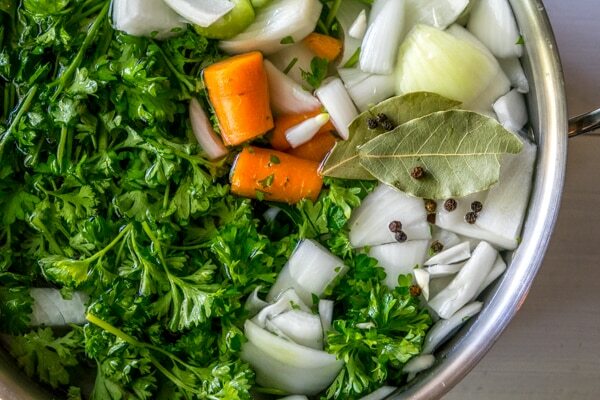 This creates a darker stock with a bigger, more complex flavor. No one can tell you which is better, they are just different. 2 onions, 10 small carrots, 3 celery chunks. Dice them up and create an even layer on a roasting pan. Then we use the same process as before. Add to a stockpot and fill to the brim with water. Add parsley, peppercorns, and a bay leaf. Bring to a boil, then reduce heat and let simmer for 60-90 minutes. Strain into a mixing bowl and let cool. Here are the two versions side by side. Deciding which to use is a good dilemma to have. I’m a fan of the roasted version, but I don’t always make it that way. 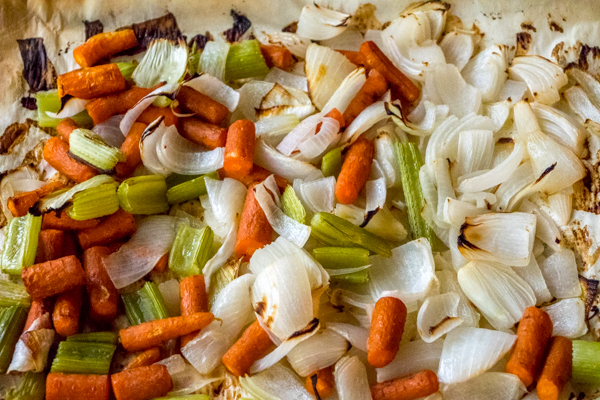 Roasting the veggies adds another hour to the process. 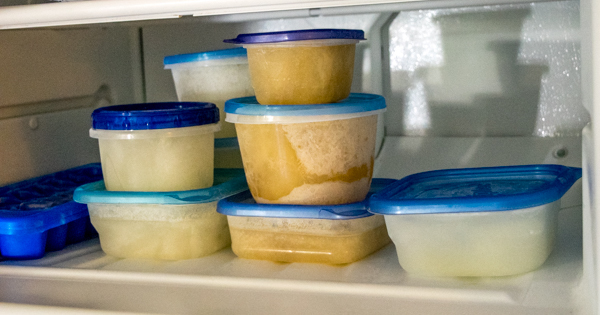 Which brings me to the final tip to ensure you always have good stock in your fridge: when you do find time to make it, be sure to make lots of it. 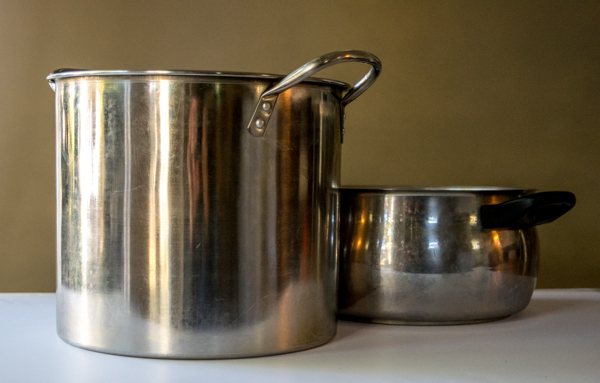 The gallon sized stock pots will leave you with close to 16 cups of stock. Not bad. 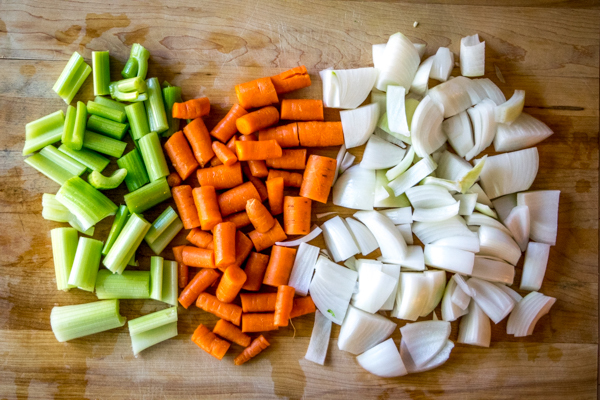 You’ll get 32 cups of stock from about $4 worth of veggies, so 12 cents a cup. A typical storebought stock is 4 cups for $3, or 75cents a cup. And the flavor of yours is ten times better. Not bad eh? The smaller containers hold 2 cups of stock. The larger containers hold 4 cups. You can also use muffin tins or ice cube trays if you want to freeze smaller sized portions. OK, don’t forget the deal you made with the chefs. 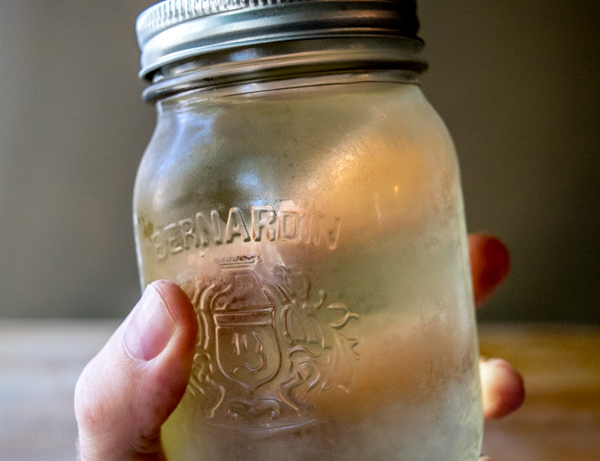 If you’ve read this far then you have to try making your own stock at least one time. Trust me, it’s worth it. It’ll change the whole dynamic of your kitchen. Work it into your routine and it’s only a matter of time before people start asking for your secret. A light, vibrant stock that can be used in any number of soups and sauces. So good! P.S. 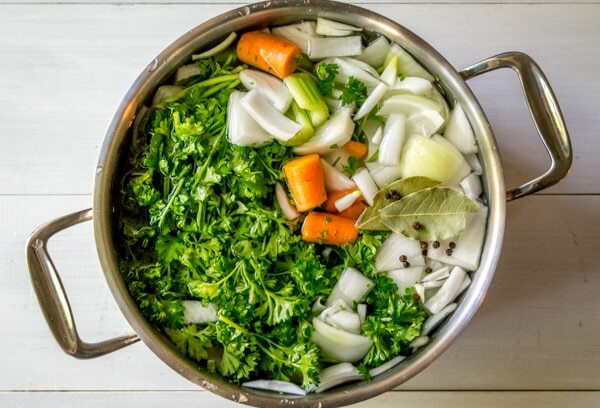 This veggie stock will work great in our Pinto Bean Soup. I have a question, please. What amount of Thyme, would you use, per a gallon? Any thoughts on, since Mexican Oregano is used so often, adding a base amount.? Awesome, thanks much for the details Aliza! I’ve been wanting to try this as the slow cooker has been on my counter for the past few months, but somehow I haven’t got around to it yet. Must be some awesome stock though after cooking for that long, thanks for the inspiration! Do you peel the onions before you roast them? Would the peel burn if it was in the oven that long? Do you separate the peels, not roast them, and then add them for color while the stock is simmering? Hey Jan! Yeah I usually just peel the onions and discard the peels whether I am roasting them or not, so I usually don’t add the outer skin back in when simmering. I do think the peel might char in the oven so I would be hesitant to roast the entire onion. But you’ll get tons of opinions on this one as I’m sure there are chefs out there who use the entire veggie when making stock. 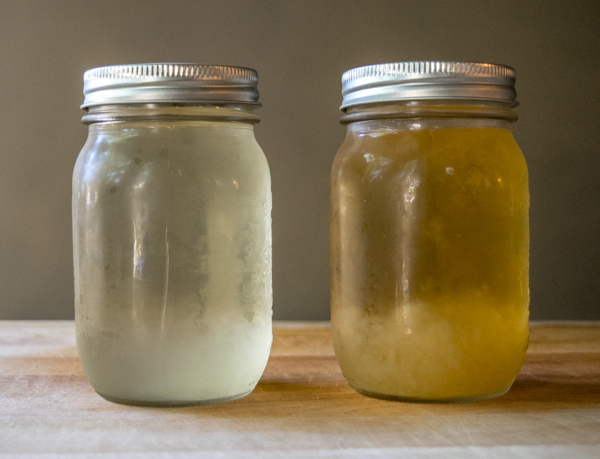 Either way, your homemade stock will still outperform anything you can buy at the store so I hope it treats you well! Cheers.